Located right off Hwy. 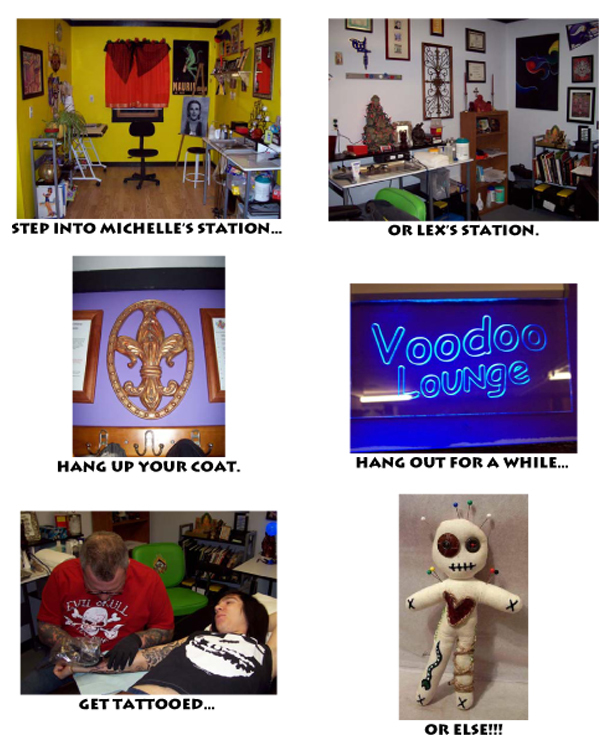 10 in Big Lake, VOODOO TATTOO STUDIO is at the southwest corner of Hwy. 10 & Eagle Lake Road, at the intersection of Putnam & Eagle Lake Road, right behind Marlo's Haberdashery. FROM THE CITIES: Take 94 Eastbound to Exit 193/Hwy.25-Monticello. Turn right (North) and follow Hwy. 25 (a.k.a. Lake St.) directly into Big Lake. Turn right onto Hwy. 10 (a.k.a. Jefferson Blvd.). At the first stop light (Eagle Lake Road), turn right. We are on the right, directly behind Marlo's Haberdashery, just before you reach Putnam Ave.
FROM ST. CLOUD: From Hwy. 10 - A quick drive east on Hwy. 10 & you'll find us on your right at the corner of Hwy. 10 and Eagle Lake Road, just behind Marlo's Haberdashery. From 94 - If you are traveling east on 94, simply take the exit for Hwy.25 North directly into Big Lake. Take a right turn onto Hwy. 10 and a quick right at Eagle Lake Road, we're on the right, behind Marlo's Haberdashery, just before you reach Putnam Ave.
FROM ELK RIVER: Simply follow Hwy. 10 west for about nine (9) miles. Take a left at the corner of Hwy. 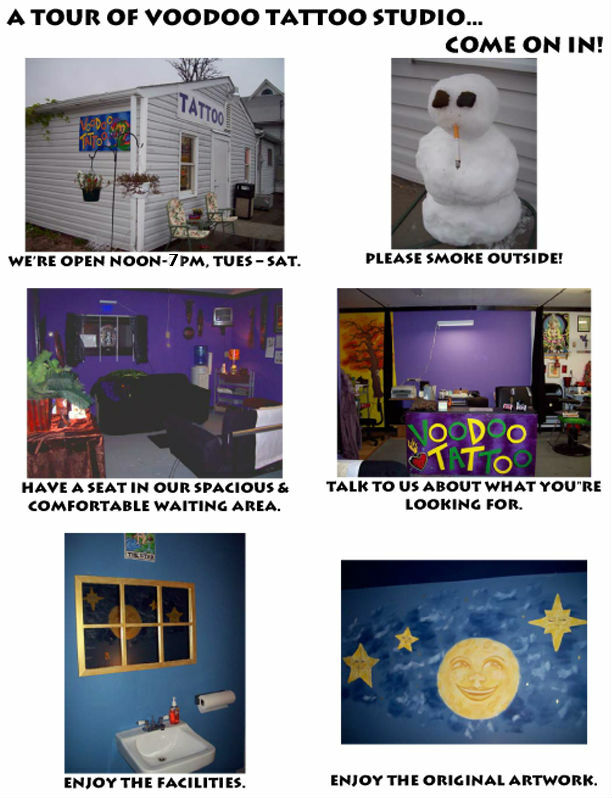 10 and Eagle Lake Road and you'll find us on the right, behind Marlo's Haberdashery, just before you reach Putnam Ave.
Voodoo Tattoo Studio welcomes your questions and comments!